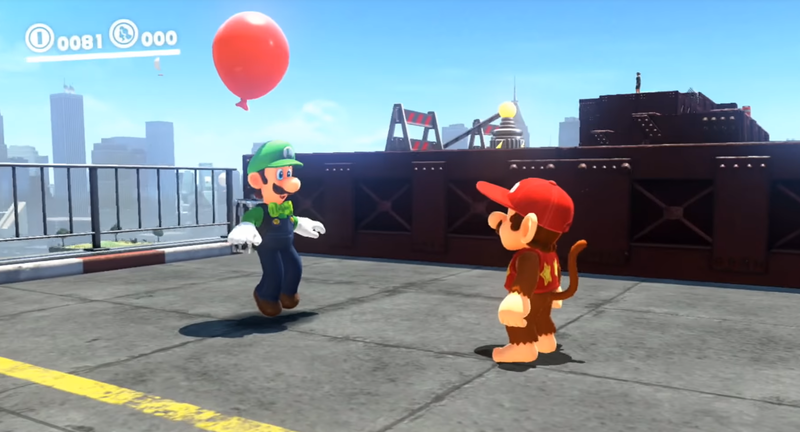 Luigi is finally in Super Mario Odyssey as part of the game's new Balloon World update which went live this week. What strange wind brought him and his balloons to New Donk City is anybody's guess, but while he's around he has some thoughts to share about Mario's clothes. Last fall we wrote about how Bowser says different things to Mario during the game's final boss fight depending on Mario's outfit. Luigi does the same thing in this new update. GameXplain explored all of the different dialog possibilities in a new video, and they are definitely, 100% pure, unadulterated Luigi-isms. If you show up as a Luigi doppelganger, decked out in a green shirt and cap, Mario's brother will say, "Huh? What? Another ... [Luigi emoji] me?!" (Yes, he uses emoji in regular spoken conversations.) He continues, "No, wait. Is that you Bro? Whoa, you really threw me for a loop there!" If you're invisible, the two-time ghost-vacuumer will get spooked. "You're scaring me! ...Are you still there? I'm just going to keep talking..."
If you approach him as skeleton, he'll say, "Bro! You Startled me! That outfit is kinda, ummm... How can I put this?.. I mean, it looks good on you! It looks good, but uhh... Yeah…"
In addition to being funny little character moments, a lot of Luigi's comments are a good case study in how not to compliment someone on their latest outfit. His segues are dynamite as well: "Hey, Bro! You saved [Princess Peach emoji] Princess Peach, huh? So proud of ya!" And if you're wearing a retro costume or one belonging to another character, like the Waluigi's colours, he'll mutter something about feeling like he's seen it before. Finally, Luigi will be wounded if you show up in a wedding gown. "Whoa, Bro, you're getting married?! AND YOU DIDN'T TELL ME?!" he says. "Oh, you're just wearing the outfit? For, like, fun? Huh." Luigi, Bro, like, please never change. If i remember correctly, every time someone said someone's name in Odyssey they would show a little emoji of the character, i don't think this was exclusive to Luigi.